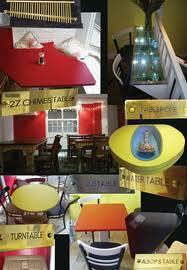 Bom-Bane's | Cafe in Brighton serving delicious homely food and hosting many a night of film, music and puppetry. Jane Bom-Bane will sing a song or two later on after evening meals have gone out if you ask her, and does a longer (bookable) performance every month solo, with Kate Daisy Grant, Becca Dyer or with one or two of The Silver Swans (Eliza Skelton & Emma Kilbey) after a set two-course meal – all for £17.50. (Pre-paid bookings only.) You can suggest a date to initiate one of these Fri or Sat dates. March 23rd and April 13th 7pm: Jane with Eliza Skelton will serve you a set 2-course meal, then play a selection of original songs, to the accompaniment of guitar, harmonium and mechanical hats… See menu above for dates of other performances. We sometimes have live music downstairs on Tuesdays or Thursdays, and every Wednesday we have cheap food ‘n’ something else night. When we have music or a film downstairs, people are welcome to come and eat or drink upstairs after the events start downstairs, but I’m afraid they will have to chat quietly. Well, if the film/music is quiet, whisper really. Bom-Bane’s is officially twinned with The Waiting Room, in Eaglescliffe North Yorkshire.